Hi everyone , today we will be discussing an exciting new project in the blockchain space ,Bgogo . As the title represents , this is an exciting and new type of exchange concept in the cryptocurrency space . And we are very excited for this concept and think this can be a winner for sure . Bgogo is Cryptocurrency Exchange of the Community ,by the Community and for the Community . And we will be discussing this in details . The team have came up with concept of super node listing authority . Bgogo is the first digital asset exchange to implement this . Mineable tokens (50% of total supply) will be reserved for users in the form of high-frequency trading fee rebates, commonly known as mining through trading. A number of tokens equivalent to 105% of the trading fee will be rebated to the user in only 30 minutes after the trade. Bgogo reserves the right to adjust the rebate rate as we grow, but we promise to maintain a minimum rebate of 100%. The price of token will be determined by the market price at the time when a trade is finalized. Every 24 hours, Bgogo will use 100% of the trading commissions accumulated to repurchase BGG. The buyback tokens will be sent to a burn address made public. Former software engineer at Facebook, and also the former founder of Facebook’s crypto syndicate. He holds a Master’s degree in Computer Science from UCSD. He is also a senior blockchain researcher, influencer and advisor. He helped and directed several popular blockchain projects in Silicon Valley such as QuarkChain. Formerly worked in Facebook’s U.S. headquarters and was responsible for maintaining the network security of 2 billion Facebook, WhatsApp, and Instagram users. He has won the ACM-ICPC International College Student Programming Competition Regional Champion. Nicolas holds a bachelor’s degree in computer science from Shanghai Jiaotong University. Former operations chief of Huobi and founding team member of Gukebao. Oscar holds a Bachelor’s degree in Finance from Renmin University of China. Formerly worked at Boston Consulting Group, Deloitte Advisory, has rich work experiences in financial analysis, strategic consulting and corporate management experiences. She provided portfolio and asset management for billion scale hedge funds and private equity fund. She won the Championship for 2018 Blockchain Consensys without Borders Summit Project. The exchange is already live . Already 14 crypto assets are trading on the exchange with ETH and BTC pairs . Also , the one of the most anticipated project Dfinity (DFN) is on the exchange . Bgogo.com guarantees that the exchange will deliver DFN tokens to the accounts of users when DFN is officially and publicly distributed and traded. It is so called I Owe You (IOU) trading, and users are trading one kind of futures of DFN. Bgogo has 21 supernode . These are selected from leading cryptocurrency entities .These entities will participate in the BGG token private sale. 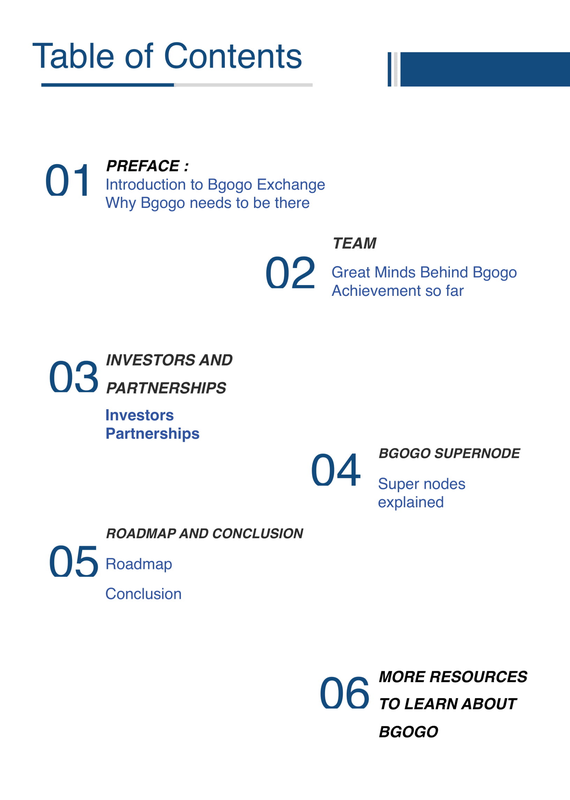 Playing a key role in the Bgogo ecosystem, each supernode is granted the “One Vote, One Listing” right as well as the benefit of “20% Per-Trade Commission” over a lifetime. Tenure for supernode is one quarter ie around 90 days . After this period , the re-election of supernode will take place based on the top 21 accounts in BGG holding position. Each supernode has something called ‘ONE VOTE- ONE LISTING ’. Let’s understand what that is . Each supernode is entitled to “One Vote, One Listing” authority. This privilege gives status holders the right to pick a cryptocurrency to list on the Bgogo trading platform during its tenure. This is under the premise that the cryptocurrency nominated passes legal qualifications and is approved to be listed by the project team. In the event where multiple supernodes are competing to list the same cryptocurrency, Bgogo will respect the project team’s decision of which supernode they choose to nominate them. Thus, a total of 21 coins from supernodes should be listed during each quarter. Excluding the first generation supernodes, all supernodes starting from the second generation are required to lock up their BGG balance during their tenure. Supernodes should perform due diligence and guarantee the authenticity, reliability, legitimacy of the cryptocurrencies they choose to list. BGG is the platform token issued by Bgogo exchange to participate in the BGG trading ecosystem.There is a total fixed number of 10,000,000,000 BGG that will ever be created. Bgogo is a new concept in the cryptocurrency exchange space and we are excited to see how this unfolds . We are very much optimistic on what they are doing .